翻訳してみたらそんなに意味は変わらないと思ったのでそちらをクリックしたのですがページが変わりAre you sure you want to confirm goods receivedと出ました。そしてBy clicking ‘Confirm’, Purchase Protection will be ended and Purchase will be finalized. 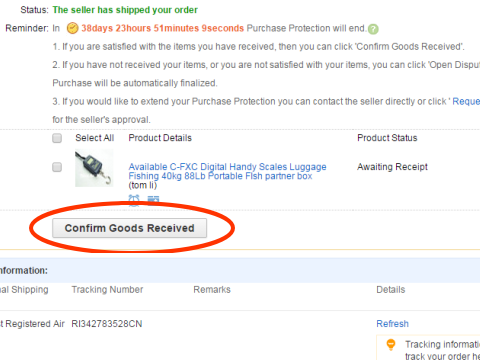 Please make sure you are confirming that you are satisfied with the items you have received. Note: After you Confirm Goods Received, you will not be able to open dispute for this order. Leave feedback for this transaction now! here is the tracking NO. under Fedex #665345140059 for reference. Your payment is being processed. Please do not close this page. Tips: pay attention to the currency of your order and the currency of your bank account. When you calculate, make sure they are converted into the same one. Oops, something went wrong there!Before attempting the purchase again, we recommend you to check your order history to see if the payment successfully processed. Payment failed Oops, something went wrong there!